I was hoping that Ben Bernanke’s two testimony would provide us with some much needed momentum in the euro vs dollar currency pair, but unfortunately this was not to be, and yesterday’s candle was a re-run of Tuesdays, ending the session as a doji of indecision, as the pair struggle to break above the 1.43 level. Technically the chart looks bullish, with all three moving averages now beginning to turn higher once again, as they unwind from their tight bunching of the last few weeks, and with the strong consolidation now offering a good platform for a move higher, this is the direction I would favour at this stage. 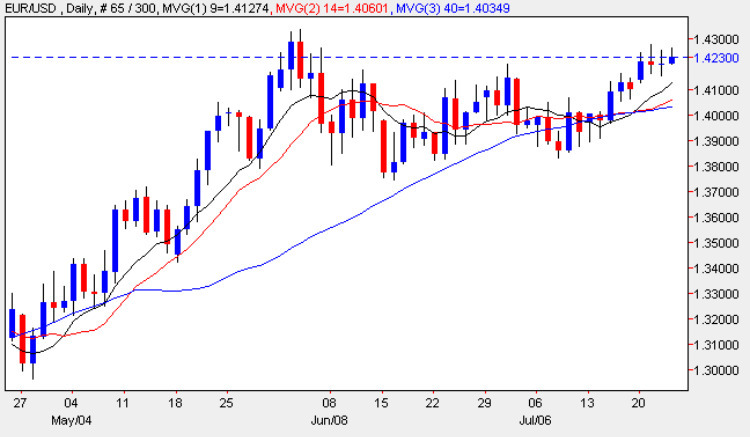 However, until we see a break and hold above the 1.43 level, then we cannot be certain, so my suggestion for today is to continue to take a wait and see approach – it this does occur in due course, and provided it is supported with all three moving averages, then at this stage we could consider longer term trend trades. Until then, we need to wait for the breakout to occur. The fundamental news on the economic calendar is very much ‘business as usual’ today, and I have covered all the main items for you on the euro to dollar site. The key one this afternoon will be the weekly unemployment claims, which if worse than expected could help the US dollar should investors take fright and look for the safe havens once again.